On January 15, 2012 I took my first trip to Transylvania County in Western North Carolina for a hike to a few waterfalls. What I witnessed that weekend fundamentally changed something inside of me almost instantaneously. Since then, I have returned to these majestic mountains over and over again in search for more. Fast forward to 2018, I have hiked to 516 waterfalls and counting. 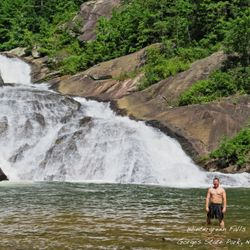 On October 12, 2014 I finished hiking to all 301 Waterfalls listed on the Waterfalls of North Carolina Map by finally reaching Falls on Mill Creek. I will continue to update this site with each new waterfall I visit so I hope you can enjoy these images as much as I did finding them! WATERFALL - wa·ter·fall /ˈwôtərˌfôl/ - a place where water flows over a vertical drop in the course of a stream or river. A steep fall or flow of water in a watercourse from a height, as over a precipice; cascade. video: Rappelling assault on flat creek falls! this is one of my top 3 favorite waterfalls in all of north carolina. never in my wildest dreams did I ever think i would return one day to rappel it. enjoy!!! Video of rappelling 140ft Elmo's Falls and bushwhacking Fork Creek, Lake toxaway North Carolina!